Soon after becoming Prime Minister, Tony Abbott was in an ebullient mood when he met his Japanese counterpart, Shinzo Abe, on the sidelines of the East Asia Summit in Brunei in October. Abbott repeated his view that Japan was Australia's 'best friend in Asia' (he had said so before, in 2010), and, more significantly, he endorsed the 'normal country' mantra used by Japan's conservatives to promote their nationalist agenda. (According to this formula, the war-renouncing constitution Japan adopted during the postwar occupation made it 'abnormal'.) For his part, Abe declared an ambition to take the bilateral relationship into a 'new phase', emphasising the 'basic values and strategic interests' shared by the two countries. We can expect to hear more expressions of mutual regard when Abbott journeys to Japan in April and Abe reciprocates the visit in July, at which time it is expected that a free trade agreement will be signed. Australia and Japan are also moving to cement closer defence cooperation — a not-insignificant aspect of what Abe calls the 'new phase', or the new 'normal'. When I was a correspondent in Japan in the 1980s and 1990s I was sometimes asked by visitors whether the country was swinging back to the right. Perhaps they had witnessed one of those vans belonging to a right-wing group cruising the streets of Tokyo broadcasting martial music and patriotic slogans. I can remember interviewing Bin Akao, a notorious rightist, who was then in his 80s, and being struck by just how idiotic these throwback fascists sounded and appeared. The white-haired Akao squatted in front of an altar dedicated to the young fanatic who assassinated Japan's Socialist Party leader in 1960, with several of his aides lined up along the adjacent wall. It was more sickening than menacing, and seemed far removed from the prevailing attitudes and interests of the great majority of Japanese. When I appeared in 1992 before a Senate committee in Canberra looking into these issues, I argued that Japan's defence ambitions were modest and profoundly constrained by a public aversion to all things military. No, Japan's extreme right might be noisy but it was largely irrelevant. After 35 years following Japanese affairs I am coming around to a different view of the present situation. The danger comes, I think, not from the shady bellicose fringe, with its links to the yakuza and their fellow travellers, but from the political mainstream, supported by a broad shift in public opinion. Bellicosity is fast becoming an approved style of public discourse. The years between 1992 and 2012, Japan's so-called 'lost decades', took a toll on the morale of the nation that has been both underestimated and misunderstood. We may think we can grasp the meaning of rising unemployment, budget deficits, deflation and anemic growth rates but such indices tell us little about how a particular people will react to their effects. The Japanese have been living, as it were, under a dark cloud, battered by falling real incomes, confronted daily by the impact of an ageing population, and disillusioned by the responses of their political leaders. A proud and industrious people, they are appalled by the thought of descending to second-class status. The assumption, prevalent among outsiders, that Japanese would accept their 'inevitable' decline, was just plain lazy. Now, for the first time since the emerging generation of Japanese voters became politically sentient, they are being offered, in Abe's new nationalism and so-called Abe-nomics, a 'feelgood' solution. It is among the young, not geriatrics like (the now deceased) Akao and his ilk, that we must look for signs of patriotic resurgence. Abe is offering to cut the Gordian knot of the piled-up problems of decades. Instead of a future of lost vigour and purpose, he wants to preserve Japan's greatness by standing up to China, acquiring a more credible military capability, breaking down structural impediments to growth (such as monopoly capital and barriers to female advancement in the workplace), burnishing the historical record to recast the nation's past in a better light, emphasising cultural and social uniformity in preference to diversity, and championing symbols of national pride that range from Yasukuni Shrine (which honours the war dead) to the 2020 Tokyo Olympics. Opinion polls suggest that most Japanese are happy to be told they should feel better about themselves, to resume using the phrase 'we Japanese' with all the complacency of former days. There is a certain manic-depressive tendency in the national psyche, and a major mood shift can be detected. While many Japanese possess an enormous capacity for endurance, they are also capable of swift changes of direction (e.g. from seclusion to imperialism in the 19th century, or from aggression to pacifism last century). I would not wish to reduce this phenomenon to the old 'chrysanthemum and sword' trope, which closes off the ways in which the dichotomy can express itself. I think, nevertheless, a tipping point has been reached. The ideological stasis that has characterised Japanese public life for 70 years is giving way. Old restraints and taboos are toppling and what will emerge when the dust settles is hard to predict. Certainly it will not be the same one-dimensional, mercantile state Australians have been satisfied to know since the war. 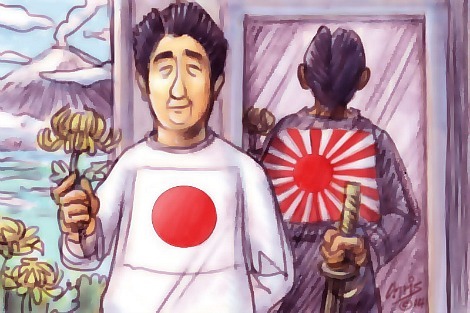 We face a tougher, not an easier, foreign policy challenge as Japan's self-declared 'best friend'. Walter Hamilton reported from Tokyo for the ABC for eleven years. He is the author of Children of the Occupation: Japan's Untold Story. Why Abbott continues to claim that Japan is Australia's 'best friend in Asia' is beyond me. Surely 'a great friend' would have been a sufficient superlative. By definition, his statement implies that nations such as Indonesia, China, and Malaysia can never be more than our 'second-best friends'. Is it all part of his inability to see anything but black and white, goodies and baddies, them and us, or right and wrong? Or does he sincerely believe it? If the latter, then he has never, to my knowledge, explained why. At least the Japanese realize diversity is not a strength. If The Australian White population falls below 50%, I cannot see Australia remaining a 1st world, unified nation. An interesting argument, though as Hamilton himself concedes, a moot one. We don't know what will emerge from Japan's long-delayed rediscovery of itself as an entity that's rather more than an occupied former foreign foe. My reading of modern Japan suggests that we shouldn't fear the future in this regard too much. Instead, like the Japanese themselves, we should look to its culture in the widest sense as the motive force that will drive the country forward. Nations and peoples respond to realities (and perceptions of reality) in uniquely complex ways. The real Japan is not the dangerous caricature of military-industrial despotism it might seem to be on the basis of narrow reading of early 20th century history. So what's so important about 'Whites' being in a majority, Gary?